years. Currently these vacancies are under Govt of India Health & Family Welfare dept under the Pradhan Mantri Swasthya Suraksha Yojana PMSSY. Eligible candidates may submit applications online for this AIIMS Bhubaneswar Staff Nurse Recruitment on or before 25-December-2017. Applications will be accepted through online mode only via AIIMS bhubaneswar Official website @http://www.aiimsbhubaneswar.edu.in/. 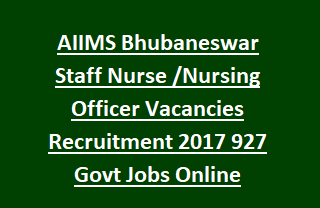 Candidates will be selected through written test for this Staff Nurse Jobs in AIIMS Bhubaneswar Vacancy Recruitment 2017. For more details regarding AIIMS Bhubaneswar Staff Nurse/Nursing Officer Jobs Recruitment please see the information prescribed below. There are total 927 Vacancies available in this current recruitment of AIIMS Bhubaneswar. for other poss refer official notification. B.Sc (Post- Certificate ) or BSc Nursing (Post -Basic) 2 years course from a recognized university and for Must have registered with Indian Nursing Council or State Nursing Council. Desirable skills are usage of computer applications such as MS Word, Excel and power point. For the post of Staff Nurse Grade I the candidates must have at least three years of work experience as a Staff Nurse Grade II in minimum 100 bed hospital. For other posts refer official notification. For General and OBC Candidates application fee is Rs.1000/-. Pay the application fee through online using net banking or through payment gateway of AIIMS Bhubaneswar online. No fee for SC/ST and PWD candidates. Selection for this Staff Nurse recruitment will be held based on written test only. Based on marks secured in written test merit list will be prepared. Eligible criteria having candidates can submit the applications form online from 02-11-2017. Online link will be deactivating on 25-12-2017. Admit card, Exam date and time, Merit list will be displayed in official website of AIIMS Bhubaneswar only. Click here to see the official notification of AIIMS Bhubaneswar Staff Nurse Grade I and II recruitment.